©2019 BREEZE PUBLICATIONS INC. Breeze THE VALLEY FREE APRIL 11-17, 2019 Serving North Smithfield, Blackstone and Woonsocket BREEZE PHOTO BY BILL MURPHY KARA PESSIA, 14, is hard at work washing the hood of a car during the North Smithfield High School freshmen We the People Program fundraiser car wash last Sunday. The car wash will help send members of the North Smithfield High School program on their trip to Leesburg, Va., to compete in the national competition later this month. See more photos on page 5. 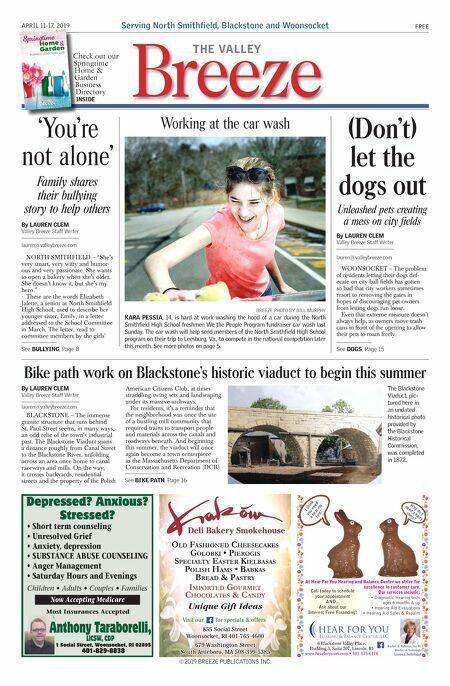 Working at the car wash 'You're not alone' Family shares their bullying story to help others NORTH SMITHFIELD – "She's very smart, very witty and humor- ous and very passionate. She wants to open a bakery when she's older. She doesn't know it, but she's my hero." These are the words Elizabeth Jalette, a senior at North Smithfield High School, used to describe her younger sister, Emily, in a letter addressed to the School Committee in March. The letter, read to committee members by the girls' By LAUREN CLEM Valley Breeze Staff Writer lauren@valleybreeze.com See BULLYING, Page 8 Bike path work on Blackstone's historic viaduct to begin this summer BLACKSTONE – The immense granite structure that runs behind St. Paul Street seems, in many ways, an odd relic of the town's industrial past. The Blackstone Viaduct spans a distance roughly from Canal Street to the Blackstone River, unfolding across an area once home to canal raceways and mills. On the way, it crosses backyards, residential streets and the property of the Polish American Citizens Club, at times straddling swing sets and landscaping under its massive archways. For residents, it's a reminder that the neighborhood was once the site of a bustling mill community that required trains to transport people and materials across the canals and roadways beneath. And beginning this summer, the viaduct will once again become a town centerpiece as the Massachusetts Department of Conservation and Recreation (DCR) By LAUREN CLEM Valley Breeze Staff Writer lauren@valleybreeze.com The Blackstone Viaduct, pic- tured here in an undated historical photo provided by the Blackstone Historical Commission, was completed in 1872. See BIKE PATH, Page 16 (Don't) let the dogs out Unleashed pets creating a mess on city fields WOONSOCKET – The problem of residents letting their dogs def- ecate on city ball fields has gotten so bad that city workers sometimes resort to removing the gates in hopes of discouraging pet owners from letting dogs run loose. Even that extreme measure doesn't always help, as owners move trash cans in front of the opening to allow their pets to roam freely. By LAUREN CLEM Valley Breeze Staff Writer lauren@valleybreeze.com See DOGS, Page 15 At Hear For You Hearing and Balance Center we strive for excellence in customer care. Our services include: • Diagnostic Hearing tests ages 6 months & up • Hearing Aid Evaluations • Hearing Aid Sales & Repairs Rachel A. Baboian, Au. D. Doctor of Audiology Licensed Audiologist 6 Blackstone Valley Place, Building 3, Suite 307, Lincoln, RI www.hearforyouri.com • 401-475-6116 Call today to schedule your appointment AND... Ask about our Interest Free Financing! I think you need a hearing test! Why do I need a hairy chest? Depressed? Anxious? Stressed? Anthony Taraborelli, LICSW, CDP 1 Social Street, Woonsocket, RI 02895 401-829-8838 • Short term counseling • Unresolved Grief • Anxiety, depression • SUBSTANCE ABUSE COUNSELING • Anger Management • Saturday Hours and Evenings Children • Adults • Couples • Families Most Insurances Accepted Now Accepting Medicare Old FashiOned CheeseCakes Golobki • PieroGis sPecialty easter kielbasas Polish hams • babkas bread & Pastry imPorted Gourmet chocolates & candy Unique Gift Ideas 855 Social Street Woonsocket, RI 401-765-4600 679 Washington Street South Attleboro, MA 508-399-5385 Deli Bakery Smokehouse Visit our for specials & offers Check out our Springtime Home & Garden Business Directory INSIDE 'You're 'You're Check out our Springtime Home & Garden Business Directory INSIDE Published by BUSINESS DIRECTORY 2019 Home Garden Springtime & ©2019 BREEZE PUBLICATIONS INC.